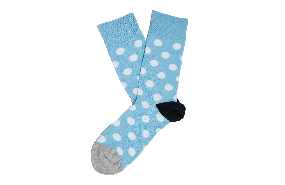 Nothing beats a good pair of spotty socks, which is why our Jersey Spot Socks are exactly what you need! The contrasting pops of colour are sure to make these ones a fast favourite. With a contrast toe and heel, these hard-wearing cotton blend socks are an everyday wardrobe essential (and incidentally also make the perfect gift).